These heavy duty wooden garden arches and wooden arbours are manufactured using FSC timber by Tom Chambers. These handcrafted and designed arbours and arches are hand built in the UK and will add a spectacular entrance and focal point in the garden and patio areas. Different designs of arbour seats include contoured and lattice back. Ideal for long summer days in the garden relaxing. This garden arbour with seat is called the Leyburn by Tom Chambers. This wooden garden arbour is a heavy duty freestanding arbor with seat. 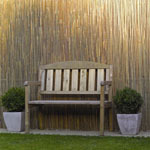 These rose arbours features include contoured slatted seat and shaped back for added comfort. 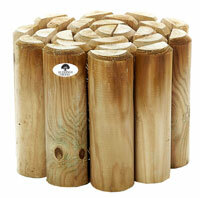 Trellis back, ideal for support of climbing plants. 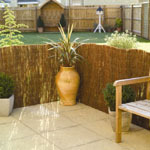 Manufactured from sustainable timber finished with a warm tan wooden stain for added weather protection. Size: 1.18m (118cm) wide x 2.03m (203cm) high x 57cm deep. 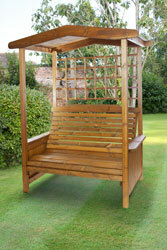 This garden arbour bench is manufactured from FSC timber and is named the Winster by Tom Chambers. This arbour seat will provide the impeccable relaxation seat and protection from the summer heat and shade from the sun light in the garden. Features of this arbour are contoured seat with shaped back of added comfort with side trellis for support for climbing plants. 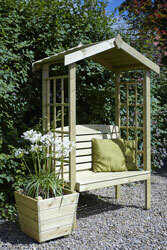 These garden arbour seat can be used in any sized garden. Roofed top rose arbor arch for protection from the weather. 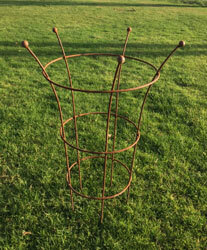 Size: 118cm x wide x 203cm high x 57cm deep. This outdoor wooden garden arch is named the Bilbury garden arch by Tom Chambers. These eye catching heavy duty timber arches with lattice trellis sides, ideal for the support and training of any climbing plant which may be planted. 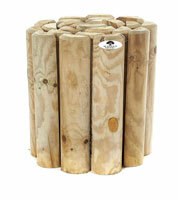 Manufactured from heavy duty quality timber which is from sustainable source. These trellis arches are finished with a warm tan wood stain for added protection against weather conditions. 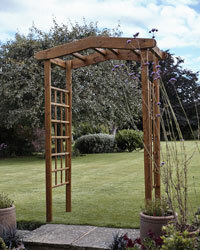 This garden arch trellis will create a stunning and specular entrance to any garden or pathway. Size: 123cm wide x 203cm high x 60cm deep. This wooden rose arch is named the Amberley garden arch by Tom Chambers. These spectacular heavy duty timber arches with lattice trellis sides, ideal for the support and training of any climbing plant which may be planted. 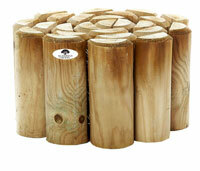 Constructed from heavy duty timber which is from sustainable source. 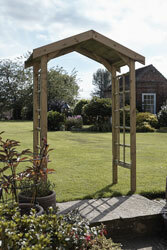 These trellis arches are finished with a natural wood stain for added safeguard against weather elements. 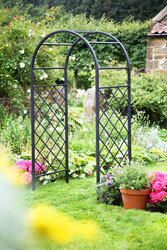 This garden arch trellis will create a impressive and impressive corridor to any garden or pathway.